This post is sponsored by Learning Resources. We love alphabet activities! Today we are sharing one of our favorite science activities... with an alphabet twist! We are also using a few of our favorite new Helping Hands Fine Motor Tools while we have fun exploring the ABCs. Make sure to scroll down to the end of this post so that you don't miss our Helping Hands Fine Motor Tools GIVEAWAY at the bottom. This science activity is super simple and totally classic. If you were A Very Toddler Christmas newsletter subscriber then you've probably done this before. It isn't new, but it is awesome! It is an activity that we could do every day and my kids wouldn't get bored. First we spread out our alphabet cookie cutters on a baking sheet with a rim to contain the mess. Next we used our cool squeezy twisters to pick up baking soda from a bowl and drop a little bit into each cookie cutter. I loved what a great little finger workout the squeezy twisters gave my daughter. Then we mixed up our vinegar and food coloring to make a few colors in our cups and we grabbed our twisty dropper. The twisty dropper is seriously the coolest tool ever. It was fought over constantly at preschool, so I think I'll be getting a few more soon. Once each letter had baking soda in it, we started dropping food coloring onto the baking soda filled cookie cutters. As she started squirting the food coloring my daughter immediately started talking about the names and sounds of the alphabet letters without any prompting from me. This is why I love learning through play and exploring! Instead of me quizzing my daughter on the letters, she was telling me their names and asking me about the ones she didn't remember... and even was brainstorming words that the letters started with. She was also really excited to discover that I included the letters from her name on our tray. As you introduce the alphabet to little ones, keep it relaxed and playful. If my daughter was not asking questions I probably would've just commented from time to time as she squirted and dropped baking soda... saying things like, "Cool! you just make the A blue" or "How fun, you just dropped a lot of baking soda right in the center of the O." Instead of saying, "What letters is this?" I just casually make observations and comments while we explore and it is amazing how much my daughter picks up. You may want to put something underneath your baking pan to contain the mess. My daughter got green vinegar all over our table today... which fortunately came off. Once most letters were covered with vinegar and were colorful, we scooped some more baking soda on top on the cookie cutters and did more dripping. This activity can last between 15 to 45 minutes with my kids... and eventually I have to cut them off from the vinegar and baking soda. Kids love checking out the interactions between the baking soda and vinegar and mixing colors too. It is amazing how much learning you can pack into a simple activity like this one without really trying. 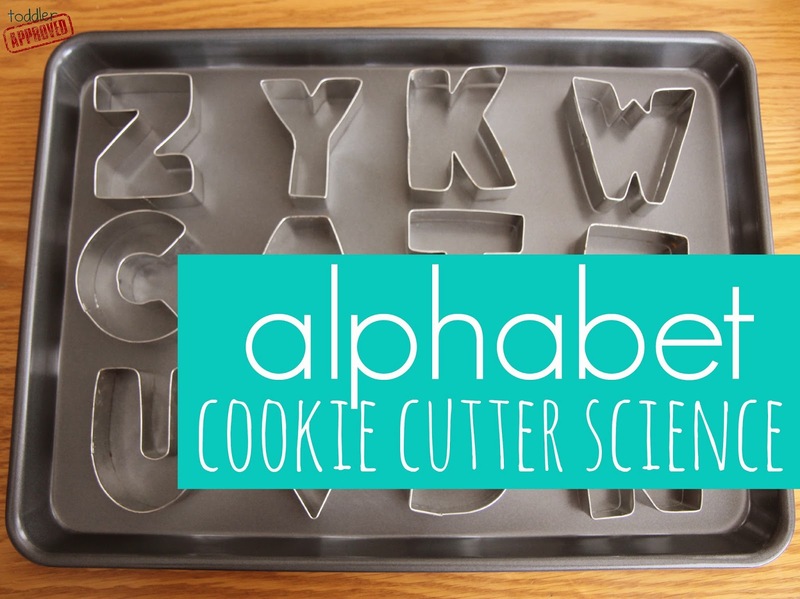 Alphabet cookie cutter science is seriously so fun! 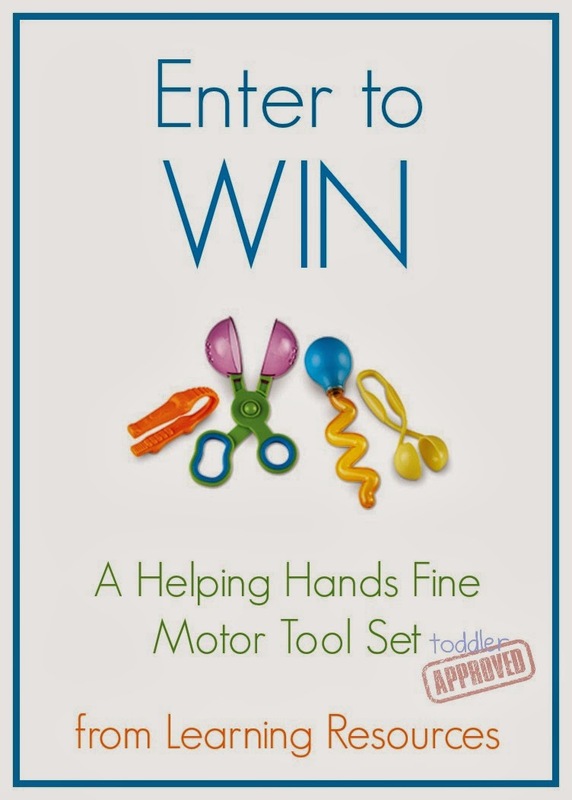 The Helping Hands Fine Motor Tool Set from Learning Resources is also awesome, which is why we are excited to be giving away ONE set to a lucky Toddler Approved reader today. Our favorite tool is the twisty dropper, but each of these tools is never actually where they should be at our house because kids keep stealing them and finding new fun ways to use them. 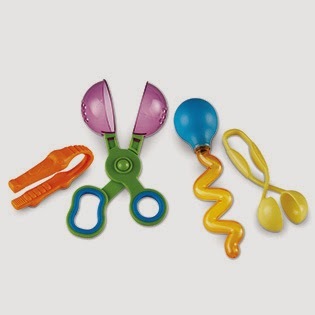 Pom poms and other small items are fun to pick up with the gator grabber tweezers. The colors are so vibrant that kids are immediately attracted to these tools! For my little one who has some fine motor challenges we are always looking for exciting ways to get her fingers working while letting her have fun and play too. These tools have been a lifesaver. She is always ready to scoop, twist, and scoop with the items in this set. Enter to win your own Helping Hands Fine Motor Tool Set. The winning entry will be drawn on Tuesday, March 25th. I will notify the winner via email. I love this alphabet cookie cutter twist! And those fine motor tools look awesome! I would put this Helping Hands Fine Motor Tool set on my list! I love how it can be used for so many things, and being a kindergarten teacher, love how it helps to practice fine motor skills in a fun way! What a great giveaway! Thanks! This is a very cool activity! My toddler loves working with his hands -- he loves his blocks to bits and is amazing at picking up smaller items and holding them in his hands like a pro -- and I've been looking at ways to branch out with him into other (albeit messier) activities! I only recently discovered this site and love the activities I've seen so far. I would love to get the Gears, Gears, Gears! Set from Learning Resources! The Doctor Set from Learning Resources is currently on our wish list for my 2.6 year old! Rainbow Fraction® Tiles. We've been wanting these for teaching fractions! Of course, being a homeschooling family, I have a thousand things on my wish list. Ha. We love the cash register! Too many items to name. I see a lot of things my little ones would enjoy and learn from. I'd love any of the counter sets. Wow I *love* those fine motor tools! My son would love them but also he'd like the design and drill set too. Or perhaps he is ready for gears? SO many cool things. I can't wait to try this with my daughter. She is in love with science and I think would think this so cool (I think it is so cool). Thank you for sharing! Oh my goodness, I can't wait to do this with my son! He would love these tools! We must try this activity at our summer tiny tots program called Fizz! Bang! Read! as we finish up our alphabet unit that began in January! Mahalo for sharing! love this idea! Thank you for all of your fun ideas! my boys(1 and 3) will love this! I love the twisty dropper! I've never seen anything like it! I have the number pops and kitchen play food on my wishlist. I love the alphabet cookie cutters. I'd love the fine motor tool set. I'd love the fine motor tool kit. id love to get my son his first doctor set! These fine motor tools are awesome. I'd love the Bake It! set! I currently have the construct a letter set (for light tables), the uppercase letter sand molds, and the letter pops on my Amazon Wish List. Yes please! & thank you! Love it! The Farmers Market Color Sorting Set would be great for my home daycare (and of course, my own toddler!). It's on my wish list! My kids would love the Gears Gears Gears set, and I would too! My kids would love the Gears Gears Gears set, and we would too! We have the Super Sorting Pie and love it. My son loves the Counting Cookies at the library. It would be fun to own these. Love this idea the tools could be used for many activities! This is such a great idea. My 3yr old Granddaughter will just love it. Any of the items would be a hit with my granddaughter and my daycare kids. MY GRANDCHILDREN WOULD LOVE THIS! I would love the word construction, or the rainbow peg play, or the scoop with the lacing sweets. So many to chose from. I have the Froggy Feeding Fun game on my wish list for my 3 year old son, along with the Twisty Droppers and some other fine motor skill items. The twisty dropper! so much fun! I would love to get the Gears! Gears! Gears! Superset for my toddler. I wold love the Gears! Gears! Gears! Superset since my toddler loves building things and playing with gears. This would be so awesome when working with my son on his home OT program! This set would be so awesome to work with my son on his home OT program! wow so many great things I am not sure yet what I would get but I sure hope I win!